Although it receives much less attention than better known disarmament processes, the destruction of small arms is reshaping the military arsenals of the world. Out of roughly 200 modern military small arms world-wide, about 500,000 are destroyed every year. The commitment of major governments and international organizations makes small arms destruction is a permanent addition to the global disarmament repertoire. But the prospects for greater military small arms disarmament may be declining, as war in Afghanistan and Iraq create unprecedented demand for second-hand weaponry. Inconspicuous disarmament of small arms and ammunition is reshaping the global picture of firearms, light weapons and ammunition. The process is far from comprehensive, but much more than cosmetic. Small arms destruction is here to stay, but its contributions may be fleeting. This book is the first full-length examination of the issue. The case studies in this volume examine the politics of military small arms disarmament. When, they ask, is surplus destruction most likely? And what can be done to make destruction more likely and more effective? Case studies examine small arms destruction by NATO and the OSCE, and in Bulgaria, Cambodia, Germany, Kazakhstan, Papua New Guinea, Romania, Serbia, Ukraine and others. This book was published as a special issue of Contemporary Security Policy. 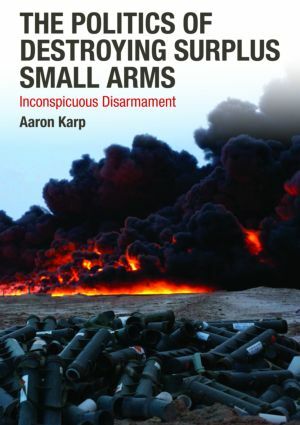 Aaron Karp is Lecturer in Political Science at Old Dominion University in Norfolk, Virginia and Senior Consultant with the Small Arms Survey in Geneva, Switzerland.